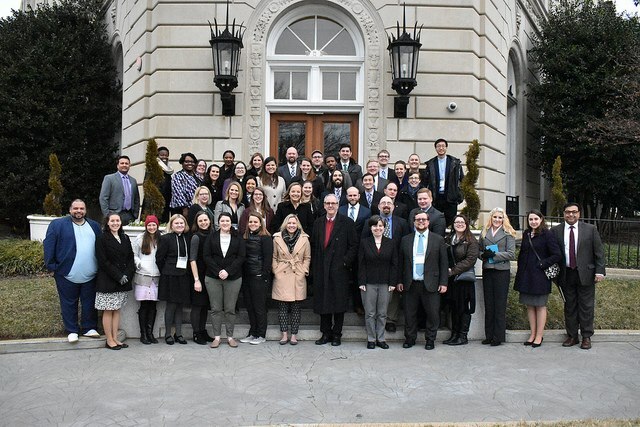 Arkansas Conference clergy attend Young Adult Clergy Leadership Forum in D.C.
Two Arkansas Annual Conference clergy members recently had the opportunity to attend the General Board of Church and Society’s Young Adult Clergy Leadership Forum in Washington, D.C. The Rev. Lauren DeLano, Conway First UMC, and the Rev. Jennie Williams, Highland Valley UMC, joined a group of 50 young clergy from around the world in a forum that helped connect clergy with the mission of GBCS and provide a gathering to share knowledge and experience across Conferences. Left to right: Rev. Jennie Williams and Rev. Lauren DeLano stand outside of the historic United Methodist Building in Washington, D.C. 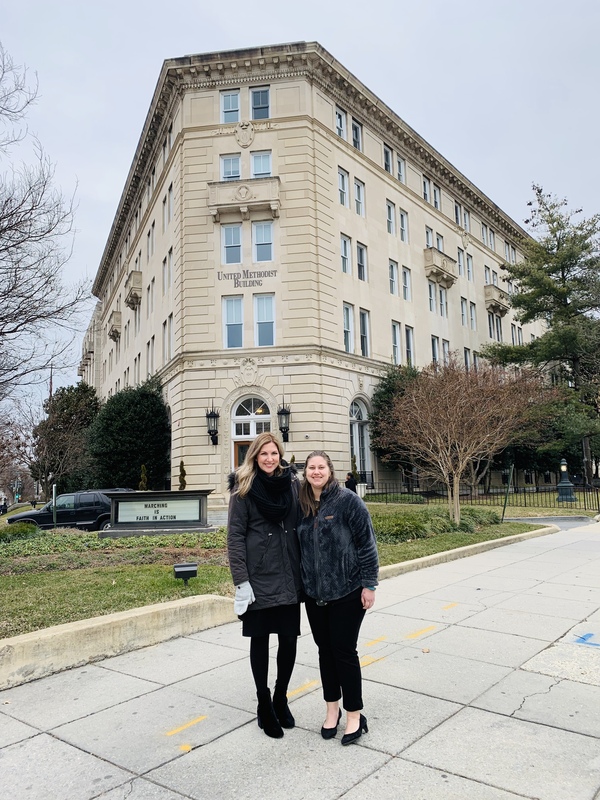 The forum, which took place Jan. 27 – 30 on Capitol Hill, hosted speakers from inside and outside the United Methodist Church, including author and activist Shane Claiborne, Director of Communications for the Council of Bishops Maidstone Mulenga, and U.S. Senate Chaplain the Rev. Brian Black. One of the topics of the forum was gun violence prevention. The clergy heard stories of gun violence from laity, gun violence prevention organizers and clergy. The group was then asked to “put faith into action” and were encouraged to visit the Senate Building on Capitol Hill and meet with U.S. Senators about gun violence prevention. Williams and DeLano were able to meet with U.S. 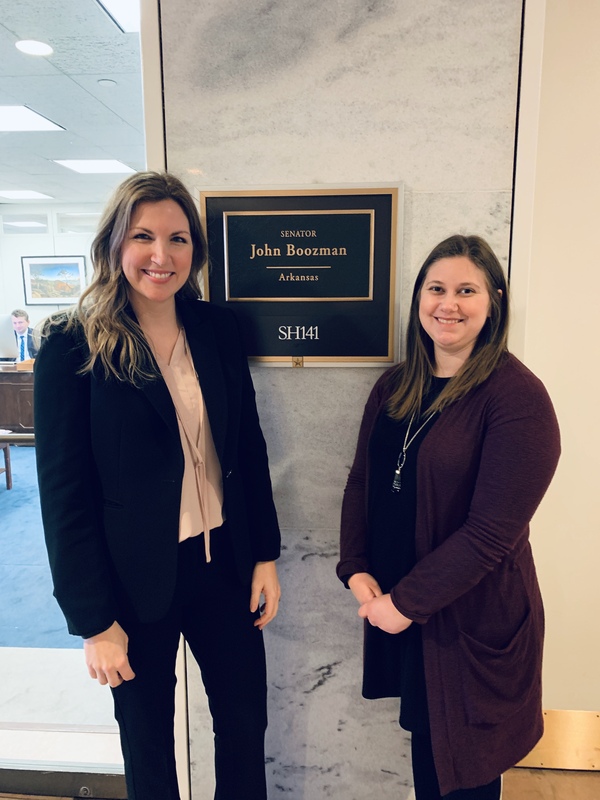 Senator John Boozman’s (R-AR) legislative assistant and said the experience allowed them to have an open dialogue about how their faith informs their views on advocacy. “As we had this conversation, I learned that being politically engaged doesn’t mean needing to have all the answers or to be an expert on a topic, it just requires the courage to have conversation, knowing that we might not all agree or change minds, but can seek to understand people of different viewpoints a little more fully,” DeLano said. Williams and DeLano had the chance to visit with U.S. Senator John Boozman’s legislative assistant about various topics, including gun violence prevention. The General Board of Church and Society is the advocacy arm of the United Methodist Church. Its headquarters is located in Washington, D.C., in the historic United Methodist Building on Capitol Hill. DeLano said the forum encouraged her to think deeply about her own experiences engaging in her local community, including her state legislature and others that who are justice-minded. She also felt a conviction to be more courageous in her faith in places that are outside the walls of the church. For more info on the General Board of Church and Society and their mission, visit https://www.umcjustice.org/.